If you are thinking about having your wedding overseas probably one of the most convenient and easy locations to get to would be Bali. There are just so many reasons why Bali makes the perfect destination for your overseas wedding that we thought that it would be easier to list these in point form. Bali is so close to Australia. It’s a 6 or so hour flight from Sydney, Melbourne or Brisbane and roughly 3-4 hours from Perth. This means that you can arrive in Bali the day you depart. Forget about nasty jet lag issues or long haul flights that leave you shattered for a couple days. With Bali the time difference is only a couple of hours which means you can adjust very quickly to your time zone. Getting there is a lot cheaper than a lot of other overseas wedding destinations. Virgin, Garuda, Jetstar & now Tigerair are all very competitive with their pricing and there are sales on all the time. Think about your guests as well. If they are going to be there at the wedding then they will appreciate these low cost air fares. Probably the best thing about having your wedding in Bali is the whole experience. If you have been to Bali before you will know what I mean. But, if you have never been to this tropical paradise then you are in for a real treat. The whole island is buzzing with activity. It is a complete 360 from what we are used to here in Australia and the sights, different culture, wonderful scenery and magnificent beaches all add the experience you are hopefully wanting for your wedding day. Bali has something for everyone. From the rice fields in Ubud, to the beaches in Seminyak and Legian, your wedding is going to have that exotic edge if you decide to have it in Bali. There are many really good wedding planners in Bali that can help you organise the whole event. From the ceremony to the reception even the accommodation. But, make sure you go with the right wedding planner. Do you homework. Speak to a few of them and make your decision based on their past performance and portfolio of past weddings. It ends up being a whole lot cheaper. If you have your wedding in Australia, the costs can easily get up to the $50 000 mark once you look at dresses, venues and the actual event. Bali weddings can be surprisingly cheap and if you speak with one of our representatives at YOUR BALI WEDDING, we will be able to customise a wedding package that is going to be more affordable PLUS give you more bang for you buck than you would have thought. If you love culture then Bali is the place to be. If you are a keen surfer, bike rider, hiker, adventure seeker, party couple then Bali also ticks the right boxes as an overseas wedding destination. So once the wedding ceremony is over you can kick start your honeymoon on this island paradise straight away. There is so much to do and so much to see in Bali that you are going to be busy the whole time. On the other hand, if you prefer to kick back and lay by the pool you can do this as well. Bali has thousands of great PRIVATE VILLAS you can rent that elevate your whole wedding and honeymoon experience to another level. Personal butlers, in house massages, private pools, you own chef, the list goes on and on. At YOUR BALI WEDDING, we can arrange your villa accommodation for you and your guests through our partnership with BALI VILLA ESACPES. We have the largest range of 1, 2, 3, 4, 5 and 6 bedroom villas you can choose from, all with their own private pool! It doesn’t matter what religion you are, we can cater for al religious denominations and have a range of marriage celebrants. You should however check all the legal implication of a Bali wedding before you decide to proceed as some countries laws and religious beliefs have different legal positions about Bali weddings. If you love shopping then you can’t go wrong in Bali – for those girls or guys that love to get out there and grab a bargain then the main streets of Legian and Seminyak are the place to be. So post wedding shopping should be high on the must do things in Bali. If you are worried about how the wedding day will go because you are in another country, then I just want to put your mind at ease. In Bali, YOUR BALI WEDDING has helped hundreds of happy couples tie the knot without a hitch. We have great partnerships with numerous photographers, make up artists, caterers, florists, celebrants and venues so all you have to do it turn up and everything will be taken care of. 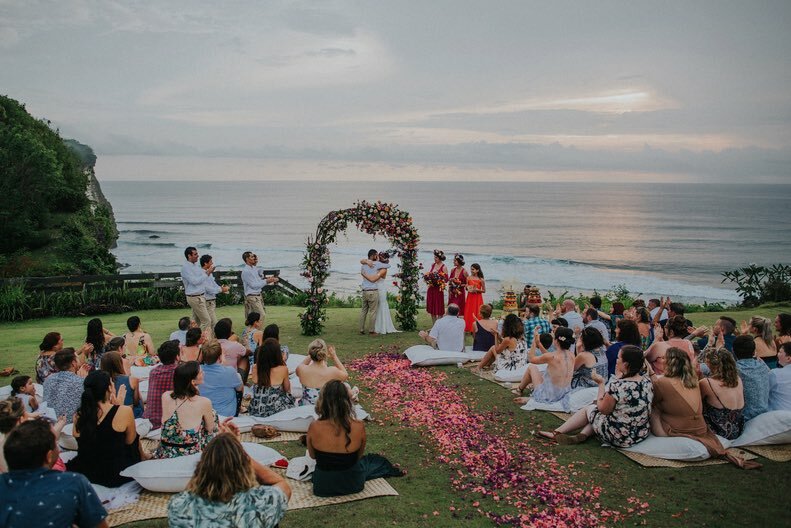 Bali is a huge wedding destination for many international and Australian couples and we know everything there is to know about making this day perfect. So if you are looking for that overseas wedding destination that just ticks all the boxes, in my opinion you can’t go past Bali.